In this picture taken in Toulouse airport last Monday 23/January –and received by email- we can see the second flight prototype MSN3 of the A350 XWB, painted and parked outside. 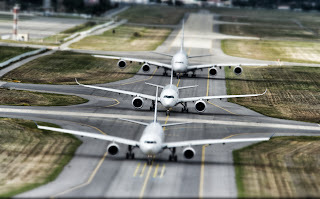 The picture was taken while the MSN3 was located at the end of the flight test line, next to the A340-600 and the A330, both aircraft that will be replaced in the future by the A350 XWB. 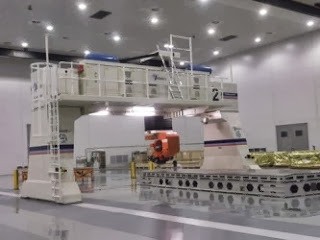 The MSN3 will be flying shortly, probably next week, joining the MSN1 into the certification program. The MSN1 has logged more than 250 flight hours in almost 60 flights, about 10% of certification program. 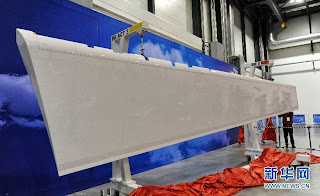 It has already met its performance specification in flight tests so far, as Mr. Leahy said, so a new phase of the certification test plan will start in comming days. 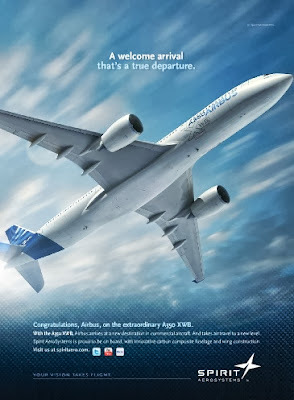 Based on the article “Airbus Says A330 to Survive a Decade on Long-Haul Discount Sales” published in Bloomberg. 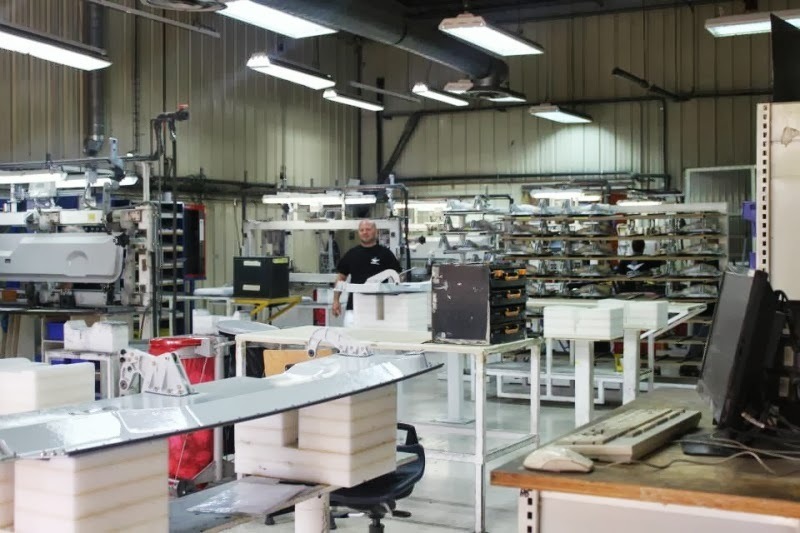 “Spirit has come a long way over the past 2 years and we have gotten rid of most of our headaches, but we still have to keep an eye on them”, Didier Evrard HO Program A350 XWB. 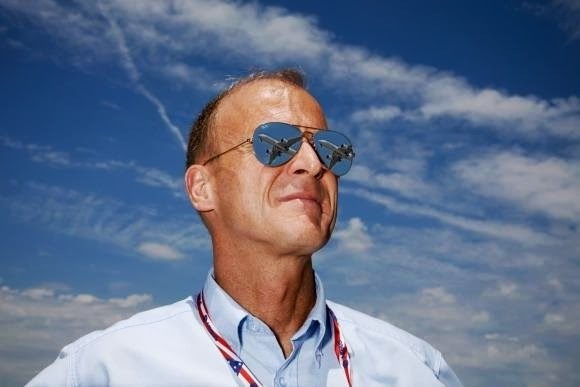 For program manager Didier Evrard, the start of flight testing only increases pressure to ensure that Airbus and its suppliers are gearing up production smoothly. 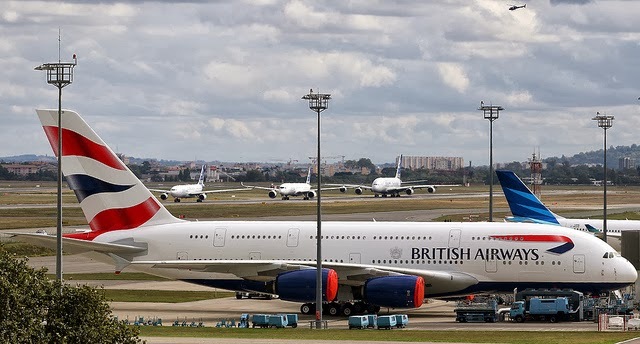 Manufacturing missteps have recently tripped up Airbus and U.S. rival Boeing developing and assembling the Airbus A380 superjumbo and Boeing's 787 Dreamliner. 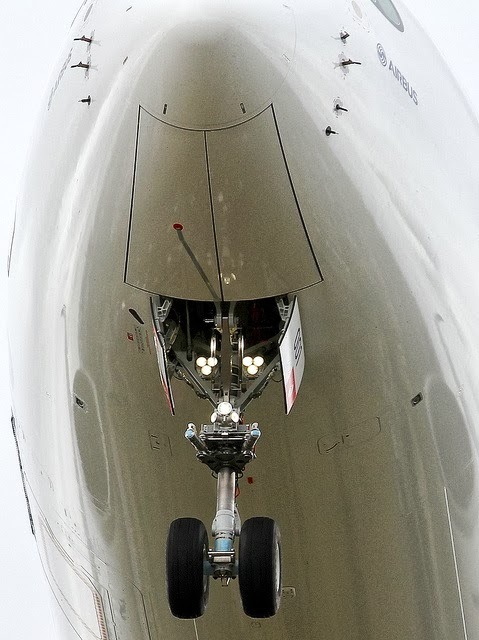 The A350 XWB, a two-engine intercontinental model designed to compete with Boeing's 787 and larger 777 models, is already more than one year late. 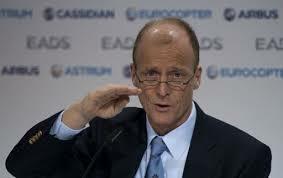 Airbus has swallowed tens of millions of dollars in extra costs, in part due to troubles at its suppliers. 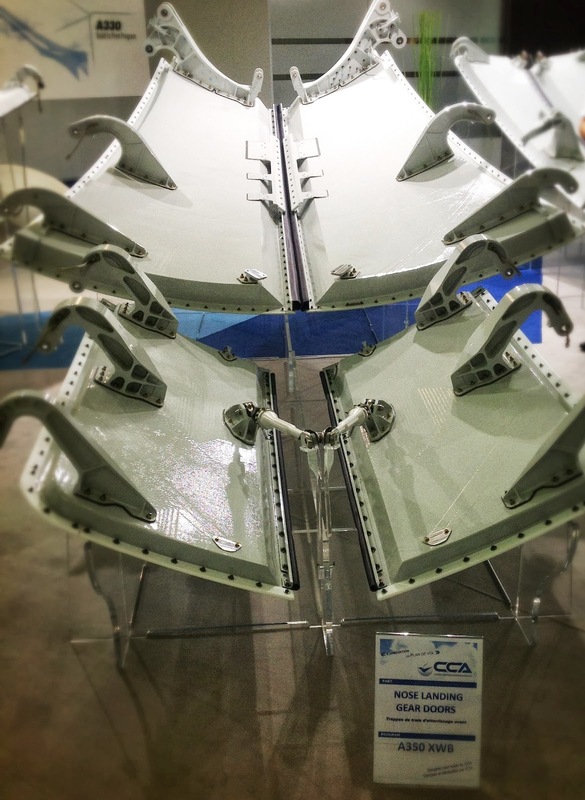 Roughly half of the A350's structure is made from carbon fiber-reinforced polymer composites that are tricky to manufacture. 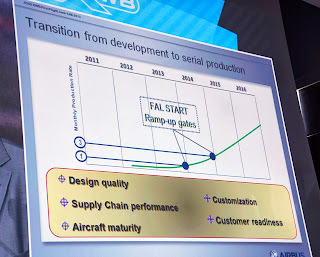 Airbus and its suppliers have struggled to accelerate production of the precision parts. 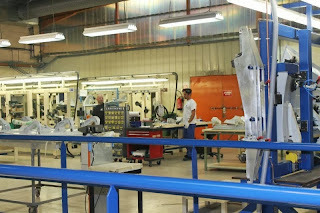 One of the biggest headaches Mr. Evrard said he has faced is with Spirit AeroSystems Inc. The Wichita, Kansas based company has been building airplane parts for decades, but only for Boeing, from which it was spun off in 2005. At one point last year, Airbus had more than 140 engineers and technicians working with Spirit to iron out problems. 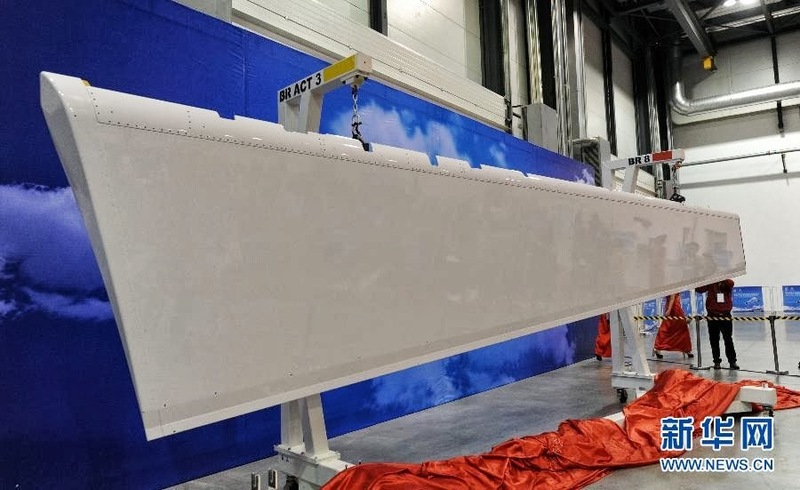 "It took some time to realize the extent of the challenge, as [Spirit] had overestimated their capability," Mr. Evrard said at an Airbus technology presentation. Spirit says the problems stemmed from the A350's novelty. 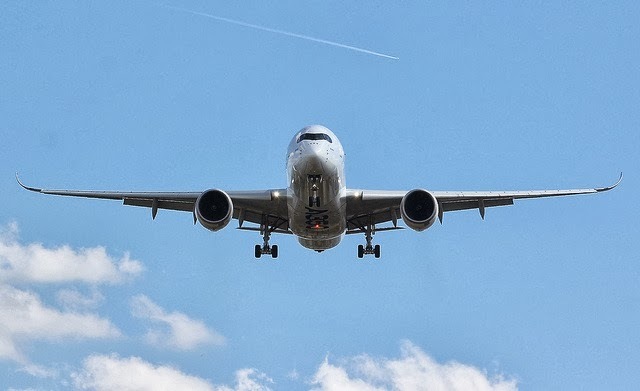 "We believe that the issues we have been experiencing are normal at this stage of a program for bringing a brand-new airplane to market," said Spirit spokesman Ken Evans. 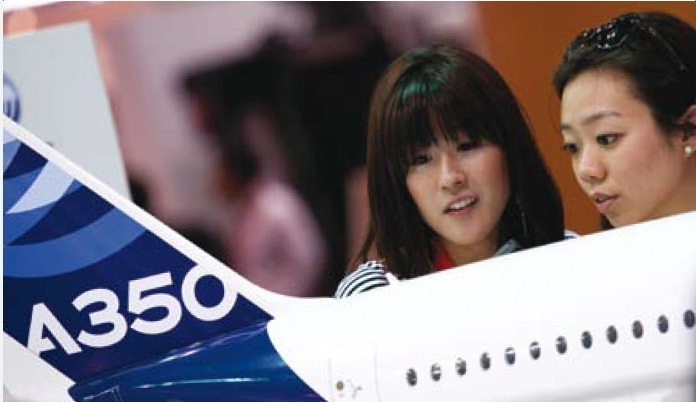 Issues at Spirit came as a surprise to Airbus, which selected the U.S. supplier largely because of its experience with Boeing. Mr. Evrard said Spirit hadn't fully adapted to independence and was accustomed to Boeing monitoring its suppliers. 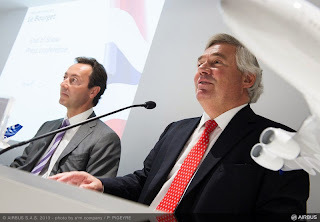 To address this, Airbus commissioned an external audit of Spirit's internal processes. 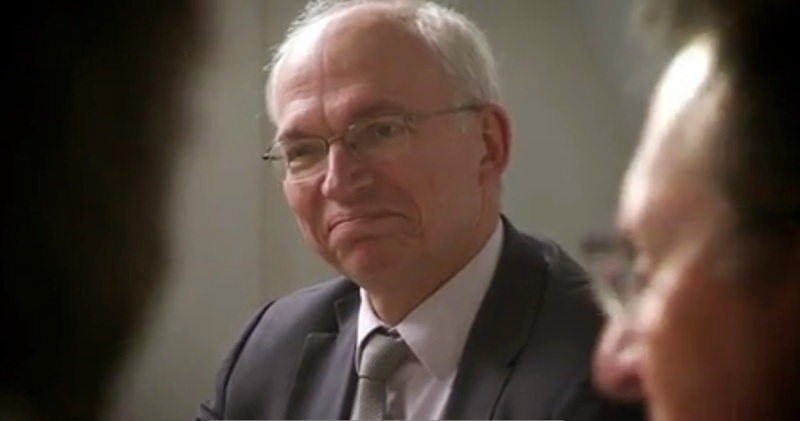 This allowed engineers and managers from Airbus to help Spirit improve its supply-chain management, Mr. Evrard said. Spirit has "come a long way over the past 2 years and we have gotten rid of most of our headaches," Mr. Evrard said. "But we still have to keep an eye on them”. 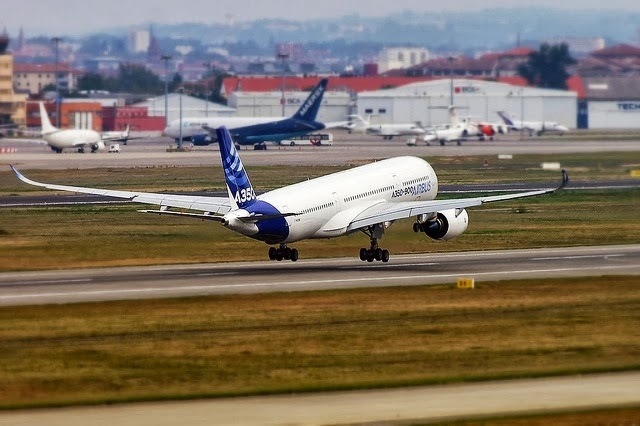 Airbus is ramping up A350 production as a boom in demand for smaller passenger jets is stretching aviation suppliers' capacity to meet increasing demands from Airbus and Boeing. 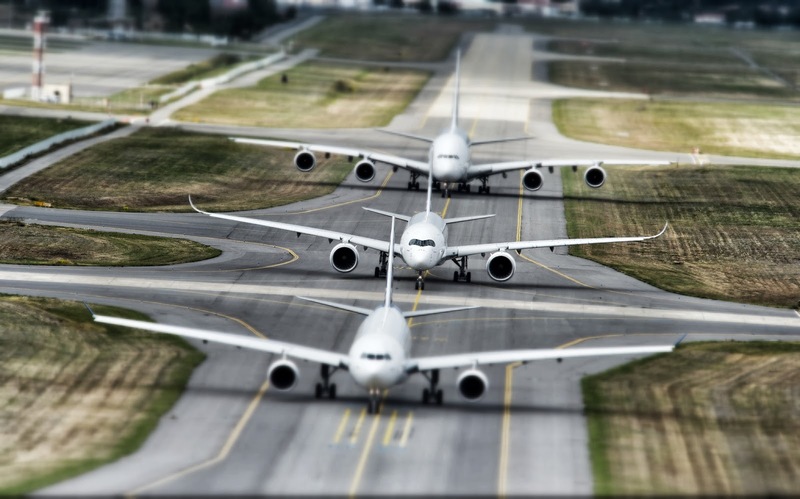 "Suppliers are dealing with a double squeeze from the ramp-up in production at Airbus and Boeing as well as the need to gear up for their new programs," said Christophe Menard, an aviation-sector analyst at Paris brokerage house Kepler Cheuvreux. 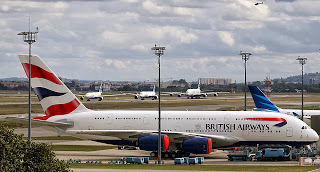 Boeing has updated the prices of their aircraft in August. model (million $) Boeing Airbus. 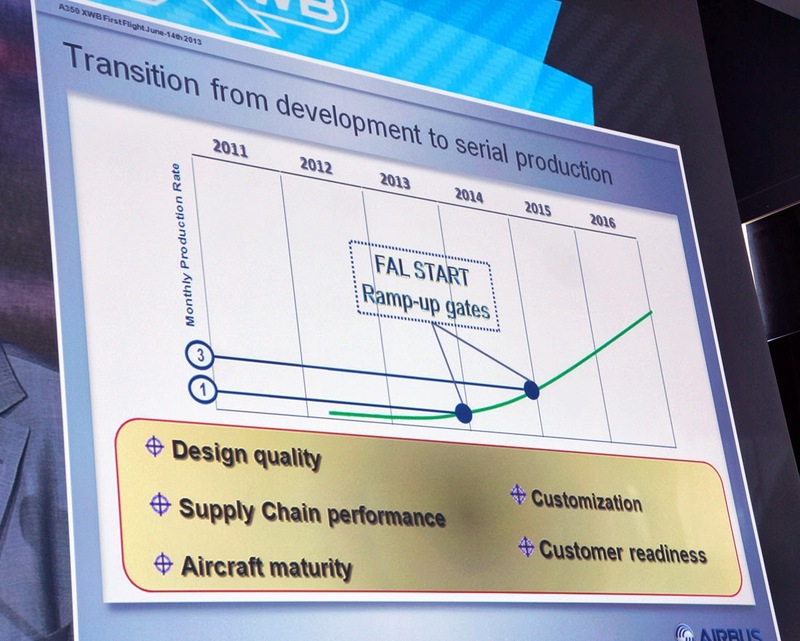 Airbus will update the catalog prices on 1st of January as usual. Price, while important, is only part of the equation, given that the airlines will get substantial discounts off the list price. 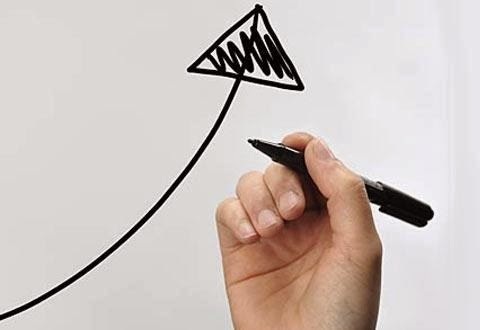 Timing may prove to be the deciding factor in many negotiations.. 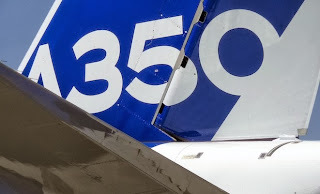 The A350 MSN1 will fly outside of Europe in November. The A350 XWB first flying prototype MSN1 will fly abroad to Dubai in November and to Bolivia probably in December. 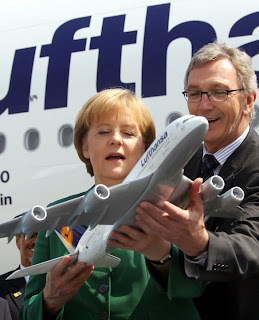 But it will fly before to Germany, Great Britain and Spain to show the aircraft to Airbus teams involved in the development for last 5 years. The Dubai Airshow, which opens on 16/Nov., might be the first occasion for the A350 to land at an airport outside of Europe. The A350 will be spending more time abroad for hot-and-high tests. 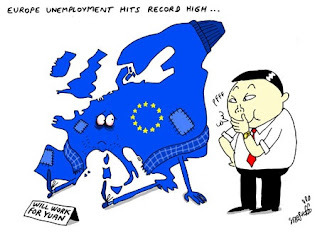 These could still happen before the end of the year or they could shift into early 2014, depending on progress achieved in the other areas. These trials are to take place in South America, possibly in La Paz, Bolivia, although Airbus has not confirmed the site. 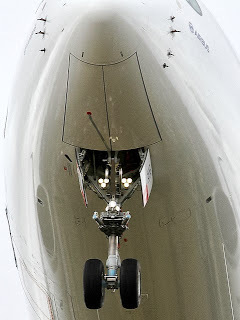 La Paz has been used for such trials in previous campaigns, including for the A340-600. 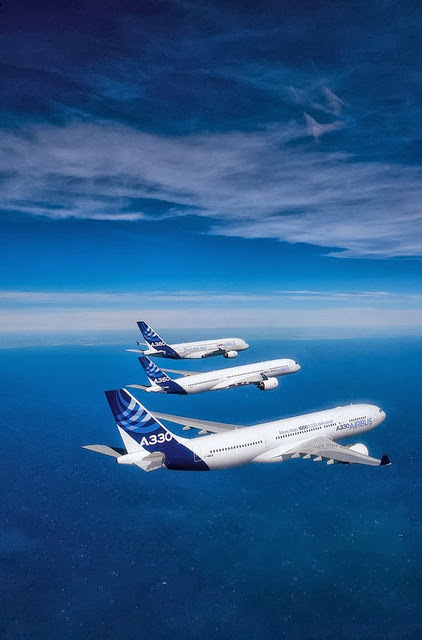 Airbus has released this video where different Airbus members talk about their jobs and functions within the A350 XWB program. 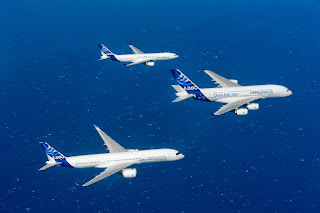 Airbus has been working to join and unify the company’s international teams in a “one family” which combine their unique skills and experiences. 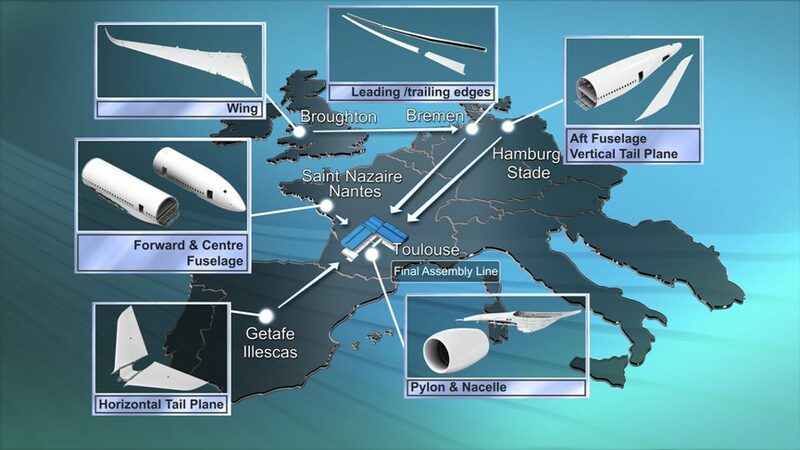 In the video, different engineers, technicians and operators from different Airbus sites explain their experience. The words “proud”, “challenge” and “motivation” are used by many of them. 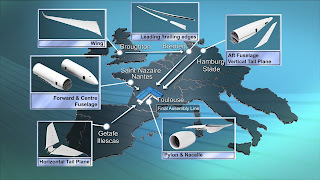 The aircraft is not only “manufactured” in Toulouse but also in Nantes (F), Getafe (Sp), Stade (G), Broughton (UK), Filton (UK) and Hamburg (G), sites shown in the video between all the factories and sites involved in the program. 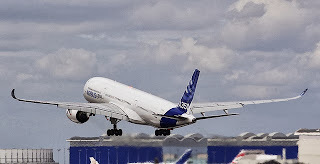 The Airbus widebody family of flight test aircraft, the A380 (F-WWDD), A330 (F-WWCB) and the first prototype MSN1 of the A350 XWB, took off from 32L runway in Toulouse on Thursday flying together for the first time before continuing on separate flight test missions. 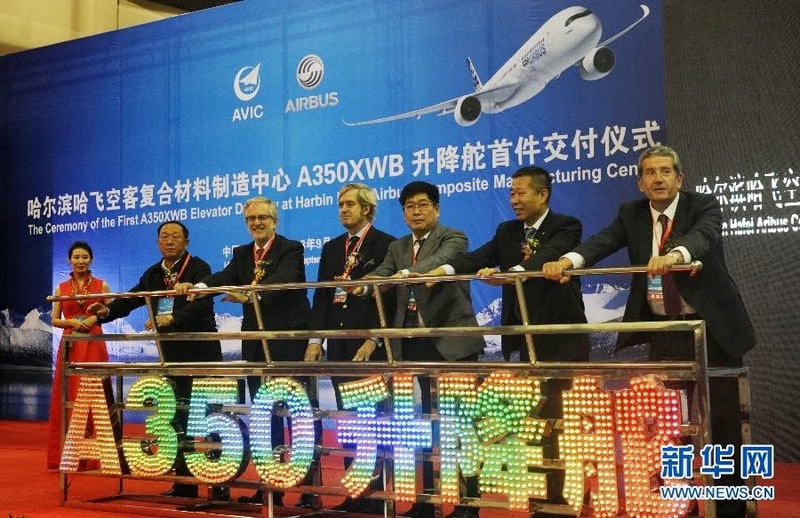 Harbin Hafei Airbus Composite Manufacturing Centre (HMC), a joint venture between Airbus and its Chinese partners, has presented in a ceremony the first ship set of A350 Elevators assembled in China. 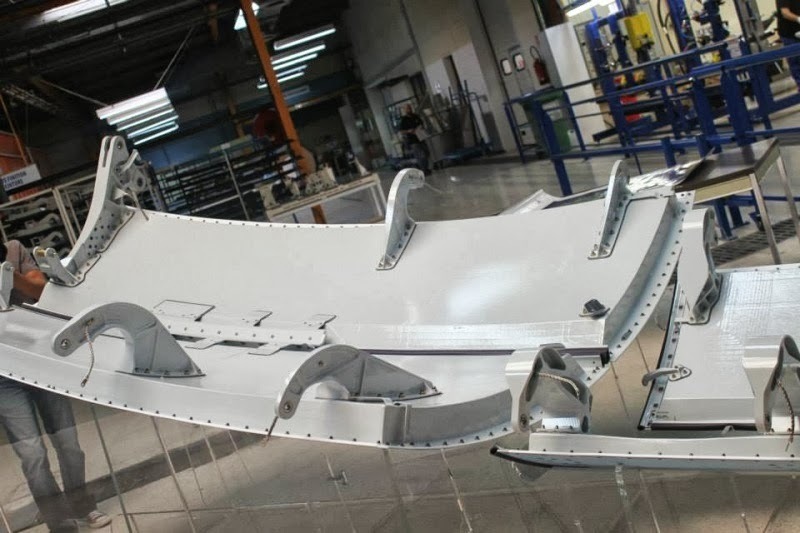 HMC is a Tier2 of Spain-based Aernnova Aerospace (ANN) Tier1, who will deliver them to the Airbus plant in Getafe (Spain) for the MSN13 in 2014, where they will be integrated into the horizontal tail plane HTP. 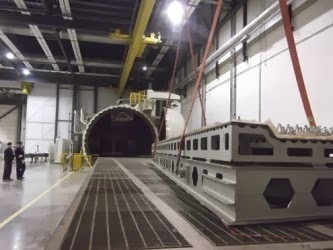 Under a contract signed by HMC and ANN in 2010, HMC is responsible for manufacturing and assembling the complete set of carbon fibre elevators. During the initial phase the A350 elevators have been solely produced at ANN. 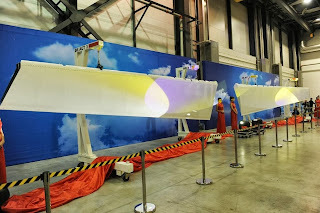 Assembly in China started in 2012 and the manufacturing in 2013. 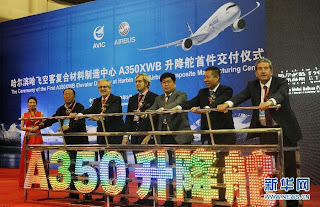 After a period of transition, during which the elevators are produced at both ANN and HMC, the Harbin Manufacturing Centre will become the sole supplier of A350 XWB elevators. Among the participants at the ceremony were Chinese government officials, Spanish Government representatives, executives of Airbus and its Chinese partners including AVIC, representatives of Aernnova and other industry professionals. 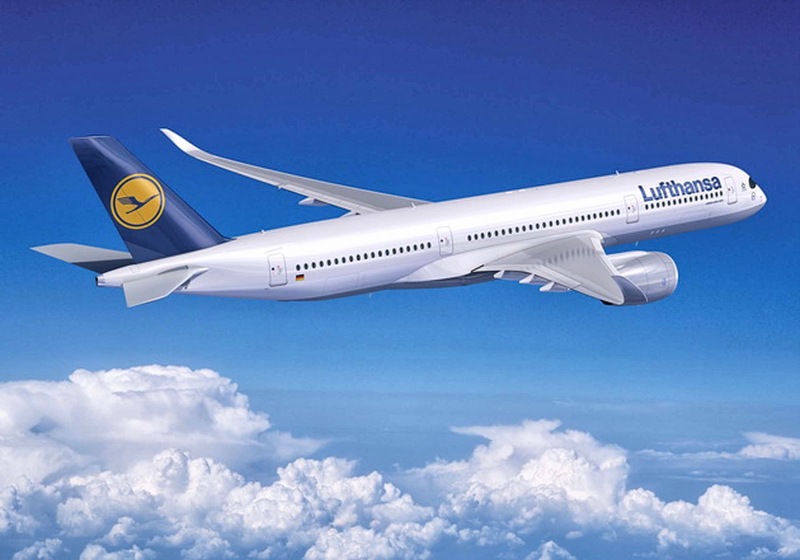 Lufthansa would split the order of about 50 aircraft between the A350-900 and the 777-9X which is due to fly by decade´s end. 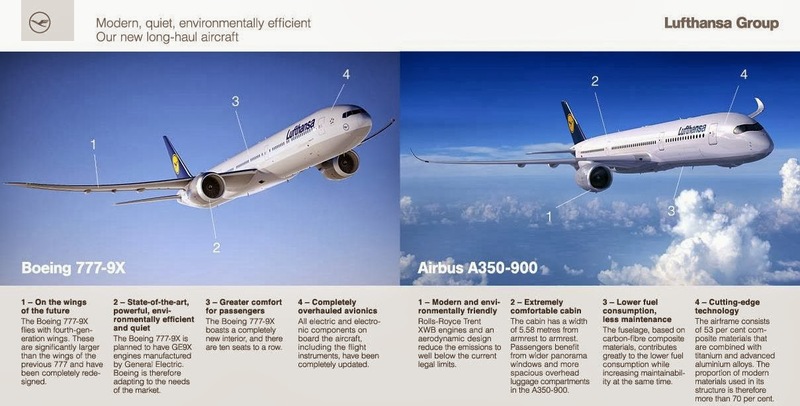 The A350-1000 could get finally out of the order as well as the 787-10. Bloomberg is reporting that Lufthansa will split an order for about 50 widebody aircraft between Airbus A350-900 and Boeing, becoming the first buyer of the 777X. 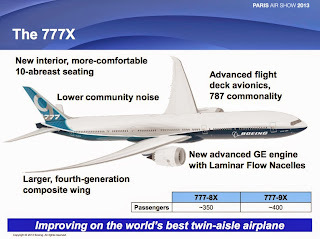 The twin-engine jets of the purchase with a list value of at least $14 billion, will be Boeing’s new 777-9X, which is due to fly by decade’s end, and Airbus’s A350-900, said two of the people with knowledge of the matter, who asked not to be identified because the details aren’t yet public. 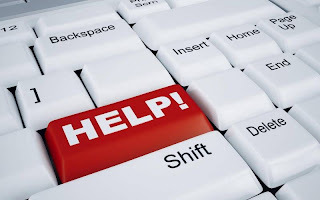 An announcement may come as soon as next week, the people said. Dividing the deal provides a boost for both plane-makers after the German airline had said the order would be a winner-take-all contest. 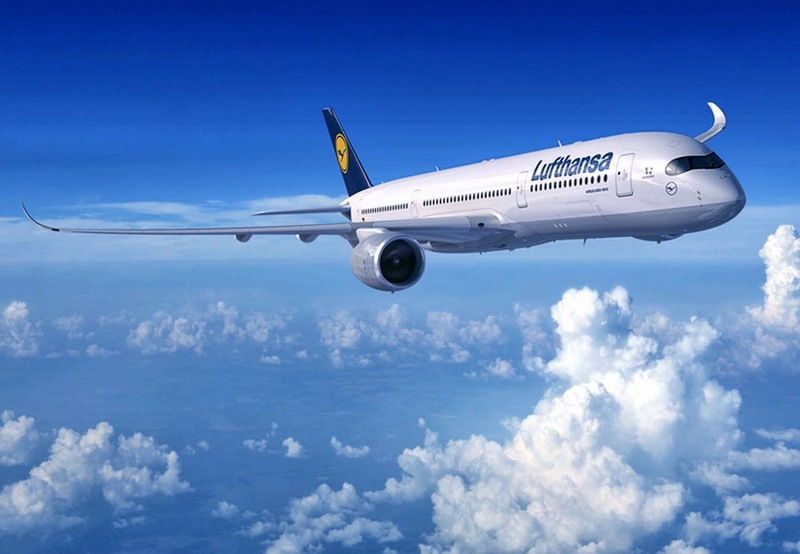 Lufthansa hasn’t bought 777s for its own passenger operations before, and has previously relied heavily on jets from France-based Airbus. 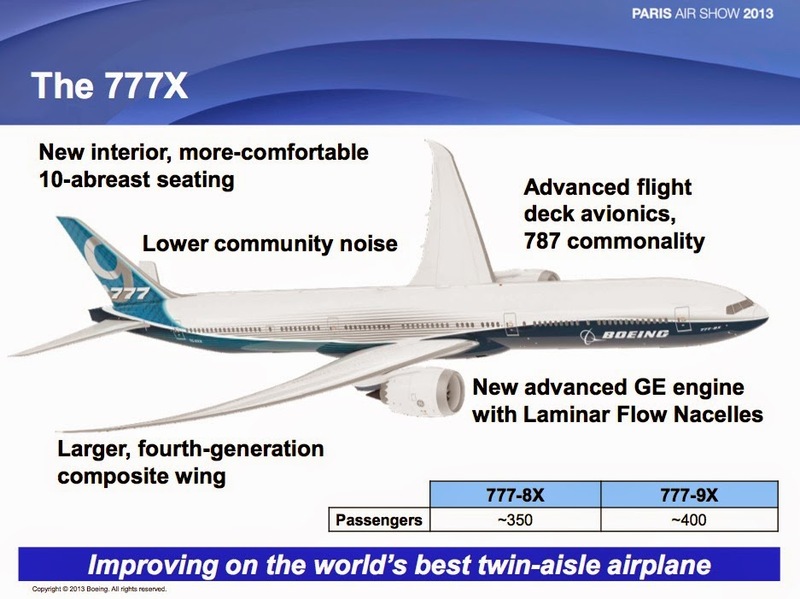 Boeing jets will make up a majority of the order, said one of the people. “No fleet decision has yet been taken by the Lufthansa supervisory board,” Thomas Jachnow, a Lufthansa spokesman, said on 13/Sep by telephone. 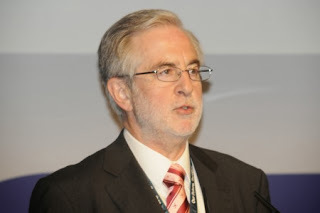 Any announcement will follow the board’s approval of management’s fleet recommendation, he said.